If you think of the typical powerlifter, you might find a 40-year-old "Dude" with a fat beard and chest hair, with whom he could easily compete with a gorilla, before ... or something like that! But what you would not think about is a 26-year-old woman who puts more weight on bench press than you and your training partner do together. Time to clean up with a few prejudices and never again question the power of a power woman. Nataliya is 26 years old, a native of Russia and a multiple record holder in deadlifts, bench presses and arm wrestling. As you can easily see, the powerlifter is also an amateur bodybuilder. And yes, her body looks exactly like what discourages normal women from starting weight training. Nataliya is on "stuff" (steroids & Co.). 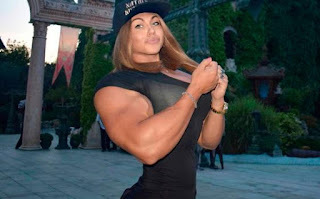 Compared to many other female bodybuilders, however, the Russian woman is relatively open about her anabolic steroids. Consequently, the 26-year-old also only participates in competitions in which the performance-enhancing substances are approved or "tolerated". As far as her cure is concerned, the Russian powerlifter claims to regularly use 150-200mg of Primobolan during competition preparation and 20mg of Oxandrolone (Anavar) on training days. However, Nataliya does not reveal which other substances are involved. However, in the past she would have thought about trying out growth hormones. But finally decided against it and put the money rather in cosmetic surgery, the Russian woman. Nataliya started her powerlifting career at the tender age of 14 and just over 40kg of body weight. Even as a child, she had the desire to become big and strong. 11 years later, the Russian is now almost 100kg on the scales. Also in terms of her best, has done a lot with the Russian. As a multiple record holder, 170kg in bench press, 180kg in squat and 240kg in deadlift are among the best. In addition to two overall victories at the Baikal Bodybuilding Championships, the 26-year-old won the European championship title in bench press and deadlift, as well as the Arm Press Cup. In addition to one or the other sponsorship contract, Nataliya mainly earns her money with "webcam modeling" - as seen in the video above. 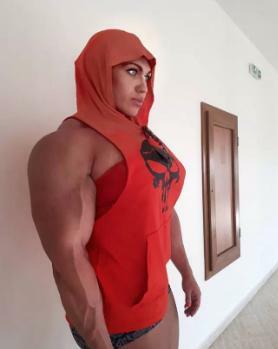 Due to her brutal mass and strength, she is often referred to as the "Russian Amazon" and most muscular woman on the planet. And rightly so, because her measurements are really impressive: her biceps circumference is just under 50cm, her waist 76cm and her thighs each just 73cm - with a height of just 1.65m.